What do a crushed, rusted syrup can; two boxes of dusty, church organ parts; and forty cedar railing posts from a dismantled, historic Oregon bridge all have in common? Dale Muir fit them to other cast-off objects, creating sculptural concepts and characters with spontaneous spirit and meaning. Now, these repurposed assemblages serve as enduring symbols of reflection, delight and possibility in gardens, businesses and homes throughout the world. 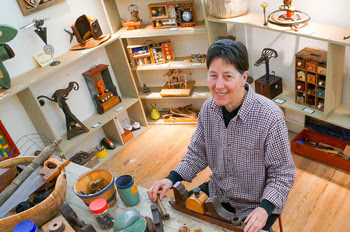 Visit Dale in her studio upstairs!